General Hospital February Sweeps: Liv Jerome’s Return! “General Hospital” Co-Head Writers Shelly Altman and Jean Passanante spoke about what we can expect for the return of Liv Jerome during February Sweeps! 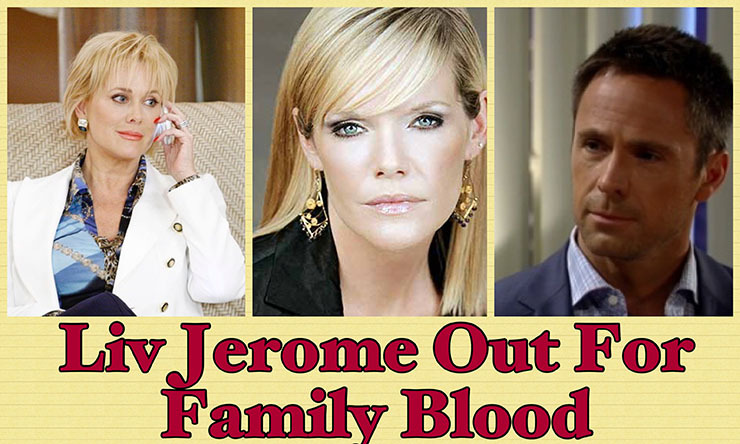 It looks like Ava (Maura West) might get what is coming to her as next week’s spoilers in this week’s SOD note that, “Ava reels as she’s accused of a horrible crime.” While Ava and her brother Julian Jerome (Will deVry) have never had the greatest brother-sister relationship, they do seem to care for one another. So, how will throwing Liv in the mix alter their family dynamic? Liv Jerome’s Real Target Is..? In the meantime, in the February Sweeps Preview edition of “ABC Soaps In Depth,” the writers told us what to expect in addition. The cover story of ABC SID indicates Liv Jerome will try to remain one stop ahead as Sonny and Jason try to flush out Morgan’s killer. Both writers revealed, “there’s some confusion that leads our heroes halfway to the right place, but ultimately it’s the wrong place. They will discover that there’s definitely a connection to Julian, but they misunderstand the connection!” We at Soap Cities (SC) think Liv might be involved in the plot to take down General Hospital. So SC readers, do you think Liv will be able to get away with Morgan’s “murder” by exposing Ava first then framing Julian for the actual car bombing. What do you think?! Next Article General Hospital February Sweeps: Whats Next for Dr. Griffin? ?